Star Trek is 50 years old! Today, though it's not quite the actual birthday of the show, we're going to celebrate with the release of Star Trek 50, a trio of brand new, boutique style expansions; one each for First Edition, Second Edition, and Tribbles. I'll have a trio of trios in preview cards for you, but first I'd like to say a few words about the volunteers that worked so hard on these projects. The creation of an expansion is a long process, often beginning two years before the expansion sees release. On the journey from concept to release, dozens of dedicated play testers, detail-oriented rules experts, wildly creative thinkers, detail-oriented proofreaders, visionary artists and inspiring authors work to make the finished product as fantastic as it can be. Each and every one of these volunteers deserve recognition and accolades for their often herculean efforts. Please joining me in thanking them as we celebrate the first 50 years of Star Trek. This was Allen's third project as part of the 1E Design Team, but my first time working with him. I very much enjoy working with Allen and he has a unique perspective as a former Rules Guru that is invaluable. I'll be working with Allen again in the future, and he's ramping up to lead his own expansion as we speak. Dan took charge of Star Trek 50: Tribbles and has delivered another fun Tribbles experience. He has worked on almost every Tribbles product and knows the game better than anyone. Corbin was tapped to take the lead of Star Trek 50: First Edition, and guided the early design efforts of the team. He had to step away from the project before it was completed, which is how I ended up bringing her across the finish line. Matt hadn't been on a Second Edition design team for six (6) years before I tapped him to join this project. His work as Creative Manager, in a set that is highly story focused, was a tremendous asset. I am an experienced designer whom, through a turn of events, ended up leading both Star Trek 50: First Edition and Star Trek 50: Second Edition. It gave me some interesting perspectives, seeing what each side was working on, but was a lot of work. I can't thank my fellow designers enough for their help. Andreas returns for his second First Edition project, and designed some fantastic cards. He also worked hard to make the finish product as smooth and clean as we could. Lucas came aboard the team as an intern specifically because of his detailed knowledge of how the game is played across the world. His insights into what was being played (and what wasn't) were essential to the creation of some fun, interesting cards. Paddy joined this project as an intern, but has impressed both Dan and myself that he's on track to become a permanent member of the design team. In fact, he's already hard at work on a future expansion! Back in 2014, cognizant of the fact this golden anniversary would be coming, we started to make plans. Reaction to the 20th Anniversary Collection had been positive, both behind the scenes and among the community. One of the things enjoyed about that expansion was the shared theme; in the 20th, it was making a card based on previous Decipher-era expansions. We decided to find a similar theme that could be shared between First Edition and Second Edition. Why not Tribbles, you ask? At the time, we weren't including the fuzziest game in our plans. One of the debates we had very early on was based on how much of Star Trek we should celebrate. Are we celebrating 50 years of Trek as a whole? Or, are we celebrating the 50th anniversary of The Original Series. From this debate, and idea was born: what if we made our theme the whole of Trek? Specifically, representing the whole of Trek with one card from each TV series and one card from each Prime Universe movie. That would give us fifteen cards per edition, leaving three extra slots for "extras." Well, when did Tribbles join the party is what you might ask. Actually, you have one specific person to thank for that: 2E Errata Team Lead Josh Sheets (prylardurden). I don't recall the exact phrasing, but he essentially implied that I would suffer significant harm if Tribbles were not represented in the 50th anniversary boutiques. Josh and I have known each other a long time, and while I was fairly sure he was kidding, I certainly didn't want to tempt fate. It turned out that we already had a Tribbles expansion in development. It also turned out that we could re-skin some of it to fit the theme. So if you're a Tribbles fan, you can thank Josh. The original team behind Star Trek 50: First Edition came up with an interesting idea. They decided to build their expansion around key story moments; as an added wrinkle, they wanted to make an expansion without any personnel or ships. It was unusual, but it ended up playing very well. It also allowed the 1E designers to really be true to some very famous story moments, in true First Edition fashion. Take a look at Prepare Landing Party. 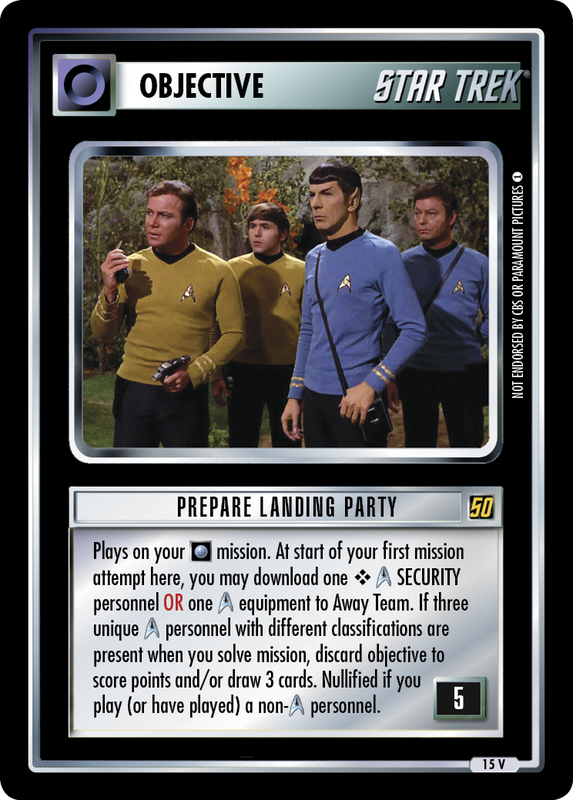 This card, based on the Original Series, captures the preparation that goes into Away Missions under Kirk. In fact, this card will allow you to get just the right equipment - or just the right red-shirt - to help your main crew succeed. One of my contributions to this card was convincing the rest of the team to remove the icons from the original card. I felt it was a good trade, removing a little bit of flavor and adding a lot of versatility. Ultimately, they agreed. When we started design on Star Trek 50: Second Edition, the team was very interested in exploring the themes of heroism, self-sacrifice, and making Integrity important again. We built an entire expansion based around those themes, even developing a new mechanic to represent "staying behind to save your friends" as well as "saving your own neck." While we really liked the mechanic and it has a very large potential design space, it had some rules and complexity issues. In addition, it was drawing a lot of focus away from everything else in the expansion. So we pulled it, hoping it will find room in a future product that can give it more love and attention. The mechanic's removal left the expansion's themes feeling a bit disconnected, so we started looking for different themes to explore. We ended up keeping the theme of sacrifice, but it transformed into more of a story based theme rather than a mechanical theme. Meanwhile, when we had been exploring heroic sacrifice and had identified some ways for the traditional "bad guys" to still get cards. After cutting the mechanic that wasn't working, we discovered we had an interesting dichotomy: stories of heroic self-sacrifice, and some villainous familiar faces. 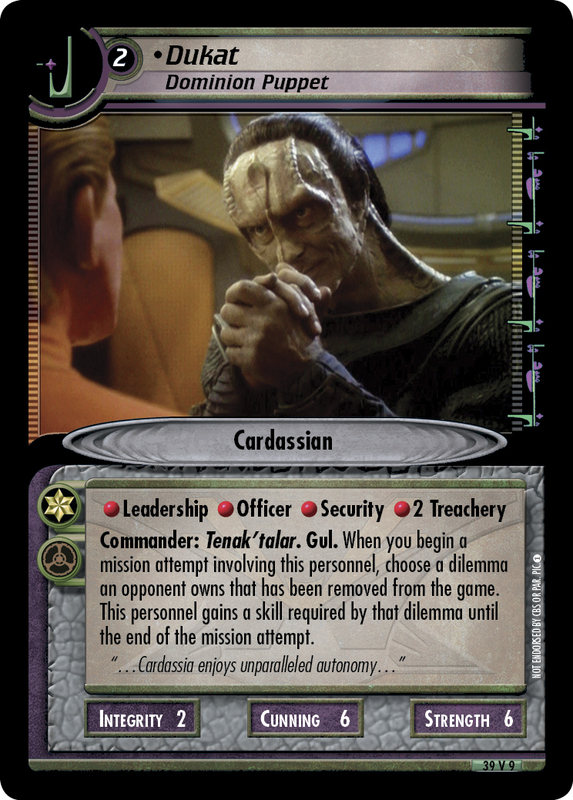 This pairing felt interesting, so we went all in, even making some old faces in new colors, like Dukat (Dominion Puppet). And there are plenty more bad guys just like him. What if Tribbles Fell Into the Guardian of Forever? I don't really have a big long story to tell you about this expansion. Dan had set out to make an expansion full of meta-adjusting cards, quirky fun cards, and thought provoking cards. The testers had some legitimate complaints, they were addressed over a few cycles of testing. All we needed was a theme. It didn't take long to decide that a Ferengi-themed Tribbles expansion was not just a good idea; it was a moral imperative upon which we had to deliver. Which is how we ended up with naked Ishka in a pile of tribbles, a.k.a. 100,000 Confront. Once we decided to add this expansion to the 50th, we wanted to put in some nods to other, non-Ferengi stories. So you'll see some famous Trek moments recreated with Tribbles. Clearly, some of the little critters fell through the Guardian of Forever. Who knows where they will turn up? We are honored to be a small part of the legacy of Star Trek. Star Trek 50 is our celebration of the history of the franchise, and the love and dedication of its fans. These three, eighteen-card boutique expansions will be releasing simultaniously on Friday, September 30th for free here at trekcc.org. We'll be spoiling cards every day, with many articles written by designers and our talented staff writers to share them with you. We hope you will enjoy the cards and the memories they remind you of, and will help you create.